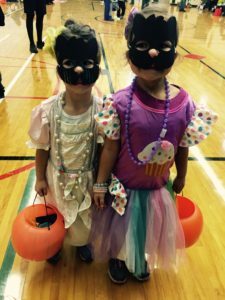 The Allergy Table Supports “Halloween Carnival Event” for kids with food allergies! 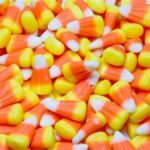 Home » Press/Events » The Allergy Table Supports “Halloween Carnival Event” for kids with food allergies! The Allergy Table was happy to be a part of the “Halloween Carnival” event on Saturday October 22,2016 which was put on by FAACT (Food Allergy & Anaphylaxis Connection Team) and the No Nuts Mom Group Of Michigan. If your not already a member of the NNMG on Facebook, check it out and consider becoming a member. It is a valuable local resoursce for food allergies families in the community. Lisa Rutter is the Director of Education for and organized this amazing Halloween event to accommodate children in our community with food allergies and food restrictions. 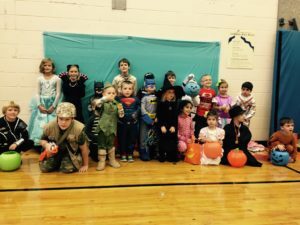 Halloween does NOT have to always revolve around candy and treats, and this event proved that kids of all ages can enjoy Halloween festivities and events that do not encompose food. A huge thank you to Lisa and all the people that helped put on this great event. There was an amazing turn out of families from the group and community who all represent the food allergy network of Michigan. My food allergic son was able to meet other kids his age with similar allergies and food restrictions, and my non food allergic children were able to partake in an event that demonstrated how children without food allergies can support great causes such as this one! There was a multitude of game and craft stations for the children to rotate through and participate in. A non-food item prize was given as a “trick or treat” goodie after each station. My kids loved their trick or treat buckets getting filled up with loot such as pencils, small notebooks, spider rings, silly putty, and so much more. 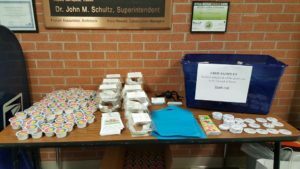 This was a great opportunity for children with food allergies to partake in an event that didn’t pose any threats to their saftey in regards to food exposure. Many vendors that represent food allergy products were gratious enough to donate items for the event’s auction. My family and I really enjoyed getting to sample products such as MADE GOOD granola bars and individually packages SUNBUTTER samples. My son enjoyed taking his “newly discovered” safe granola bar by MADE GOOD to school today to eat at snack time. These granola bars are free of all top 8 allergens and are a great school safe snack for kids. 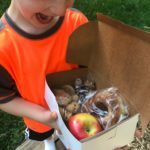 Finding new safe foods for my son to eat is a HUGE bonus to our family and always calls for a little happy dance. The Chocolate Chip granola bar is seriously delicious and the company even hides (fruit & veggies) in these bars without the kids even knowing it! Brilliant! 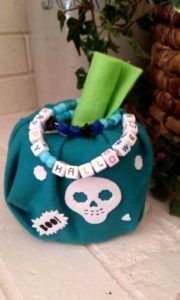 One of my favorite crafts that the kids made at the event was the “TEAL PUMPKIN”.What’s a food allergy event without a Teal Pumpkin? If your not familiar with what the Teal Pumpkin Project is or represents, check it out here at this link. Teal Pumpkin Project. Check out this super fun and easy kid friendly craft that my kids got to make and take home? Ours is proudly displayed on our porch for all to see. So what are you waiting for? Sign up to be a part of this great allergy group in our community and start enjoying events such as this one for you and your family!